Earlier this year, the chaps at WordPress added a very useful feature for WordPress.com blog owners: reply to comments via email. 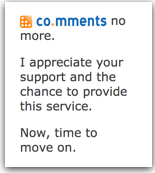 No longer do you have to plod through the comments responding to them via the reply form or through the Dashboard comment section (which despite admirable enhancements still does not offer a threaded view, making it difficult to tell if you have already responded to a comment — a very real concern for a forgetful dweeb like me). Excellent, you say. Indeed, but the nub of it is that this brilliant new feature is unavailable for self-hosted WordPress blogs (no doubt, in part due to the intricacies of tying up with the email system of the blog owner). Needless to say there has been some anguish in the community. Remember email? The Internet application that would send you messages from various sources that you could view in a sophisticated interface that let you filter, highlight, search and perform other functions on these messages? That was an awesome idea wasn’t it? Too bad its dead. Today, conversations occur in a zillion fractured places: Facebook, blog posts (comments on blog posts), Twitter, Tumblr, so on (Posterous is a happy exception, but more on Posterous in a separate post). Which means you have to visit these individual sites to keep track of who is saying what in response to something you said. Well, not entirely, since many of them provide RSS feeds, which in this context, can be considered the equivalent of an email message — many RSS readers even mimic an email interface and conversely many email applications (Apple’s Mail, Mozilla Thunderbird) are very capable RSS readers. Nonetheless, a problem remains: you still need to subscribe to RSS feeds (where available) for each of these conversation threads. Some of these sites do not provide RSS feeds at all, or some provide truncated feeds which require you to click on a link to visit the site to read a response (hey, they need the eyeballs to generate revenue), and by its very nature (or its implementation thus far) this is a subscribe model, not a publish/respond one. RSS feeds of conversation threads do have an advantage: they let you easily subscribe or unsubscribe to threads based on your level of interest. Anyone who has been on a mailing list for a good bit of time (especially a political discussion list) knows the value of this capability! However, the pain involved in adding and managing subscriptions, especially in the case of blog posts littered all over the Internet is quite daunting. Fortunately (or perhaps not as we shall soon learn) services have sprung up that provide simple tools that let you track responses to comments on blogs and a few of them are listed and discussed below, and their current status will reveal that the situation may not be so fortunate after all. Joined the dead pool. RIP. Bloppy got sloppy. Forgot to renew their domain and its parked! A pity since it was the best of the available options and included email notification. Remember email? This service is so buggy that their Join/Login screens lead to Apache error pages. Few things you can say for coComments: their domain has been renewed, site is alive, and their login screen works. But the buck stops there. In order to use the service you need to use a Firefox extension or a bookmarklet. Unfortunately the bookmarklet throws up an error “The coComment script could not be loaded”. So if you use Chrome, or Safari, or Opera you are mostly SOL. Yacktrack takes it one step beyond coComments. It works. There’s a bookmarklet, clicking on it brings up a relevant form … all good. But for some strange reason, even if you sign up for a YackTrack account, the access to your searches/entries is provided via RSS per search/entry. So, if you added comments to 50 independent blog posts, added them to your YackTrack list (“dashboard”), you cannot really get updates for all of them via one RSS feed. The point of the service eludes me… if I wanted an RSS feed per post that I commented on, then I could just have subscribed to the comment feed per post! Update: see comments from the YackTrack developer below on the purpose of the service. Backtype is slick. Looks like one of those dandy new Ruby on Rails UIs. This is a great site for gathering all your comments together in one place, or as an alternative if Google Alerts somehow does not cut it for you. It’s a “conversational search engine”. Which doesn’t always suit nicely the needs of someone trying to just follow comments on a few blog posts (for instance, backtype notifies me via email of new comments on posts I am subscribed to, but does not include any text from those comments). The vagueness of my comment reflects my inability (quite possibly my own weakness) to figure out how to work this beast to my needs. Apart from these, there are a few other options: some blogs provide a built-in mechanism to be notified of additional comments. You could also, as mentioned above, subscribe to the comment feeds for blog posts. You might even wish to just set up a Google Alert of some sort to track the post. But right now, there doesn’t seem to be a well-suited mechanism to quickly add blog posts to track and be notified (preferably via email) of comments against them. If you know better, please educate us in the comments! Correction: backtype does include details in its new comments notification. Given this bit of info, I think backtype is a pretty good solution to this problem. Apologies to those of you who have been trying to add comments and were prompted to register (which in turn was turned off!). I had never intended to turn on the registration requirement and I am still puzzled about when I mistakenly made that change. I have changed the configuration and you should be able to add comments again without having to register or enter any private information.